Lush Fab Glam Inspired Lifestyle For The Modern Woman: No Longer Like Your Tattoo? You Don't Have To Live In Regret. No Longer Like Your Tattoo? You Don't Have To Live In Regret. The idea always seems cool at first because everyone's done it or planning to do it. Whether we put much thought into the idea and choose a design we plan to keep forever. Or we stumble into a parlor after a fun filled day/night and choose the first one we see. Somehow by the time those high school, college or risk free days come to an end many of us either end up regretting the decision or simply outgrow the design. You may have already figured out exactly where this is going because you or someone you know has done it, but if you're still guessing then we are referring to removing the once upon a time super cool but now pesky tattoo. It starts with one and then the bug sets in where we see another design that we love so we get a second and a third. For others it's not about out-growing their tattoo design but rather the placement. Can you imagine walking into a job interview with a tattoo on your face (like Mike Tyson), neck or lower arms and wrist that can only be covered in the winter and even then a simple movement reveals it? Even more horrifying are the cases where you choose the wrong tattoo shop and the fierce lion tattoo you wanted looks more like the neighbor's cat. Or you can't wait to get rid of the tattoo of his/her name or face you got while smitten. Unfortunately that's the sort of regret many people endure when they get to that point where their tattoo is not as cool anymore. Thankfully modern technology has given us a way out that does not include the use of extensive makeup and concealers in a failed attempt to cover up/hide the tattoo. After just a few laser tattoo removal sessions that pesky tattoo will become a faded memory. In fact each laser tattoo removal session takes less than one hour and depending on the tattoo it can be removed in as little as 3 sessions. If you or someone you know needs to have their tattoo removed or would like to know more about the laser tattoo removal process, pricing etc then visit medermislaserclinic.com. 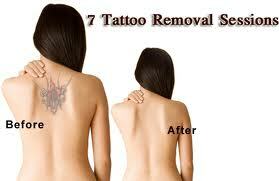 Fashion of tattoo changes every time, and It is very painful to remove tattoo. This article contains many facts about tattoo.